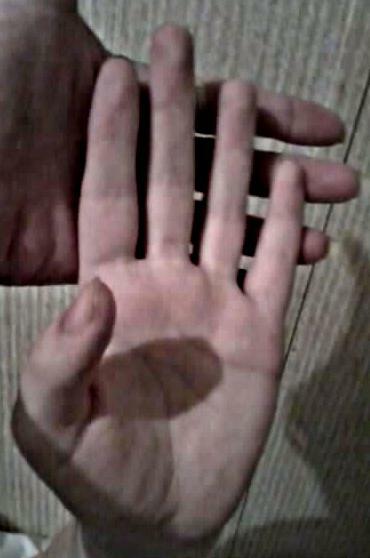 Wow, in both of your autistic sons the pinky finger is even slightly longer than the index finger - quite unusual!!! And the 2d:4d digit ratio appears to be far below 0.90. Do you or any of the other direct family members have one of those three traits??? Anyway, Thanks for sharing those photos!!! Even though the right hand of the 2nd twin boy also has a very low 2d:4d digit ratio (0.86? ), the photo left hand of the 2nd twin boys appears to have a digit ratio above 1.00 (though maybe the angle of the camera is not good enough to make a precise estimate???)... which is actually very high for a white American boy (and in the left hand it appears to be longer than the 2d:4d digit ratios of your non-autistic boy). Right hand pinky finger also appears very long (though shorter than the index finger), left hand pinky finger appears much shorter (it can likely even be described to be 'short'). But the left hand does have a curve inside the head line. I will try and get him to let me scan his hands ...my camera did seem to distort the angle a bit...His head line is different than(norm) hopefully the scan will pick it up....I remember when I first posted to the other forum years ago, I honestly thought they didnt have a head lines in their right hand , at least now they have something there ..The twins are very different in their personalities and their sensorary issues .. Yes, the father appears to have a likewise digit ratio as seen in the hands of the non-autistic son. The left hand in one of the autistic boys appears to indicate that he has a much higher 2d:4d digit ratio compared to all other family members (see below), Would you mind to check if this is really the case... or whether maybe the photo gave an incorrection impression? Thanks! 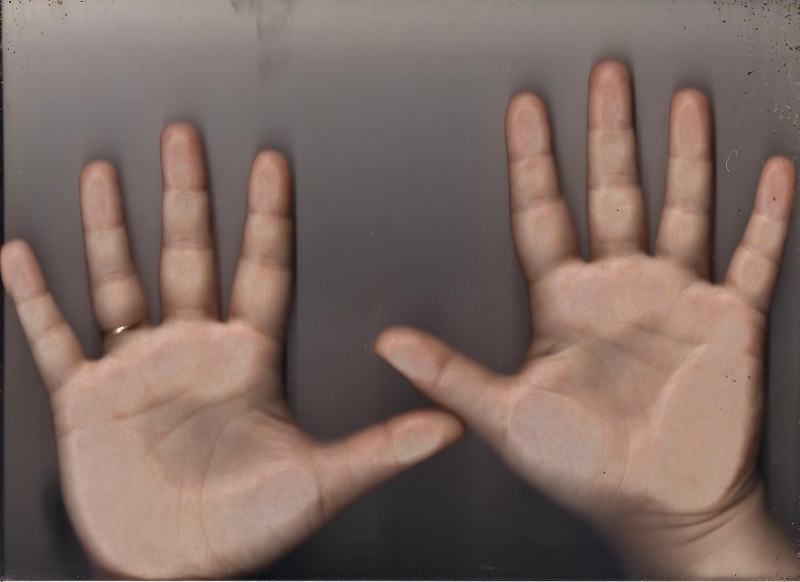 Interesting to see that this new photo confirms your initial report that in the autistic twins the 2d:4d digit ratios are much shorter (in both hands). I think this allows the conclusion: inside your family the 2d:4d digit ratios seen in the autistic twins are clearly much lower compared to the (non-autistic) family members... which obviously confirms the theory! PS. Your daughter's 2d:4d digit ratios are above 1.0, which is similar to your left hand digit ratio; so, the female members of your family also have much higher values than the male members... though I should add that this is actually a perfectly normal tendency. what do you make of the little wiggly head lines in both the twins right hands? cnriley45 wrote: what do you make of the little wiggly head lines in both the twins right hands? Good point! Though, it is hard to see the details from the photos... I remember from the past that in my autism research a 'strong curve' inside some part of the head line (which e.g. requires to be stronger than the curve in any part of the life line) has been a featured that appeared to have some significance in autism. Though I would like to add that this point is likely less significant for autism than the low 2d:4d digit ratio - because this 'extraordinary curved head line' feature is only present in some minor part of the ASD population. Maybe there is a higher significance for this feature in non-verbal autism??? PS. The significance of this point is that the normal tendency is to see that the curve inside the head line is less compared to curve seen in the life line (which has a natural tendency to have a stronger curve than the head line). PPS. I just noticed that you described the autistic twins to be left-handed... you mentioned that your husband is also left-handed: is he the only other left-handed family member? Just asking because 'left-handedness' is also known for it's higher prevalence in autism, but this implicates that we now have found 4 features in 3 different dimensions of the hand: motorics (left-handedness), fingers (extraordinary low 2d:4d digit ratio: <0.90, clinodactyly: curved pinky fingers), and hand lines (extraordinary curved head line). This combination is likely more often seen in ASD populations (my estimate would be maybe 5% up to 10%), but for sure... it's a very rare combination in non-autistic populations (my estimate would be less than 0.1%)! 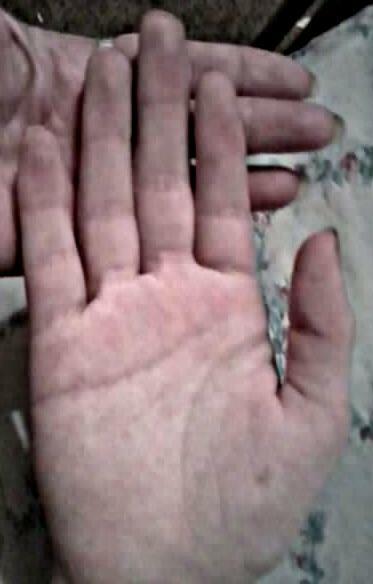 And we haven't even considered the dermatoglyphics (e.g. fingerprints)! 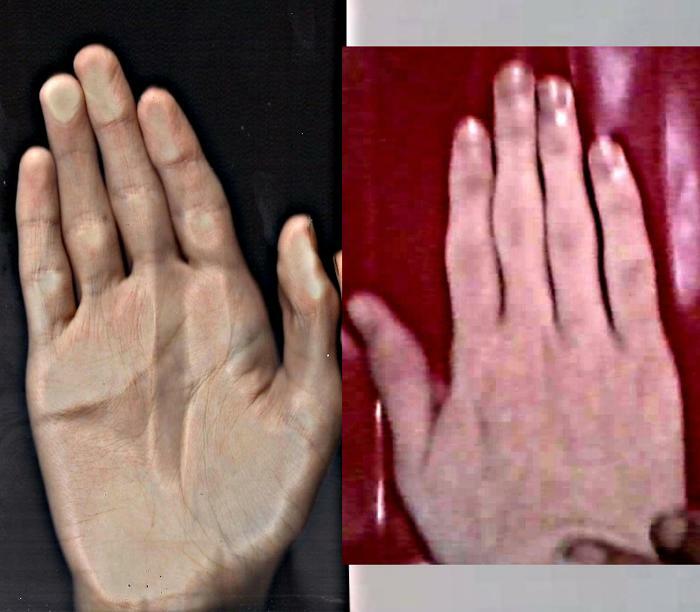 The hand scans show that the twins show in both hands that the total length of the two lower phalanges of the index finger together are about equal to the total length of the two lower phalanges in the pinky finger, in one of the twins those pinky phalanges together are actually longer than the phalanges in the index finger!! None of the other family members have this feature, but actually... I am not sure how rare this feature is because I have never seen any person/source talking about this characteristic, but this is for sure a very rare extraordinary feature! Also, I don't want to exclude here the possibility that this feature is more likely to represent a feature of a mental handicap than a feature in autistic spectrum disorder??? 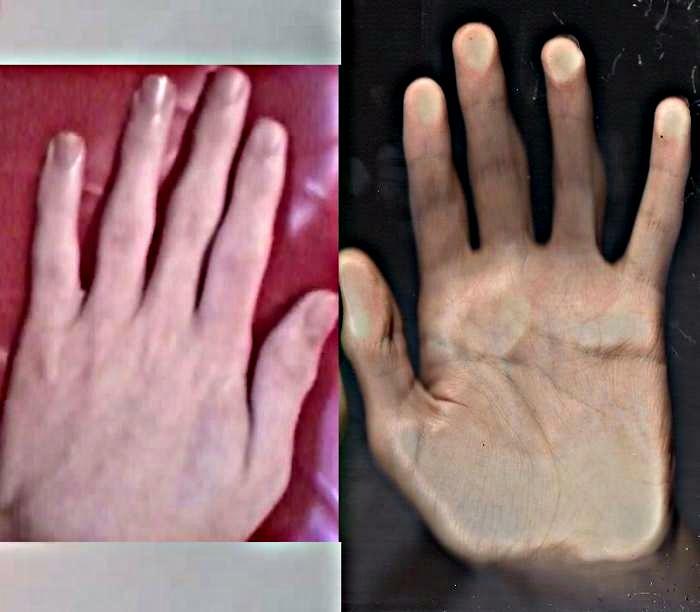 I have just checked my ASD hand collection: there is one ASD person who has this feature in one of his hands, just 1 mm in short to qualify for this feature (lower phalanges of index finger < lower phalanges of pinky finger) - by the way, this concerns a case of 'verbal autism' with IQ well above 100. PS. I have just also checked my hand collections for Down syndrome and low IQ: none of those persons come even close to meeting this finger phalanges criterium! So, at first sight it represents more likely a feature in autism than a sign for a mental handicap... the high IQ 'verbal autism' case appears to confirm this! PPS. The fragile-x syndrome samples that I have also do NOT have this feature. PS. 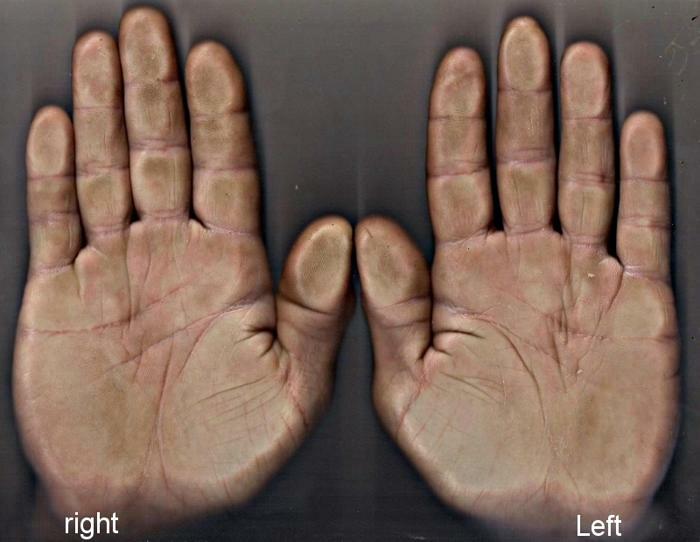 All three autism cases who meet this criterium for both hands also have a 2d:4d digit ratio below 0.90 in both hands... so the pinky finger criterium gives a clue that in autism the index finger is not only short relative to the ring finger, it is likely also very short to the other fingers! Interesting, I had not heard about that new earlier this month! So, no need to strive for genetic testing regarding that CHD8 gene. The breakthrough relates e.g. to the fact that in fragile-x syndrome the autistic behavior does not stand on it's own (because it is usually featured with a mental handicap, especially in boys)... while the CHD8 gene concerns an issue that has so far basically solely been associated with autism, not with mental disorders. PS. So far I have a collection of 31 ASD hand prints (excluding the fragile-x syndrome cases).